Pamela Pugh (top left), Tom Watkins (top right), Jim Murray (bottom left) and Danielle Atkinson (bottom right). Gov. Gretchen Whitmer will deliver her first State of the State message on Tuesday at the state Capitol. Expectations are always high for a governor’s first address, which will be televised at 7 p.m. Both chambers of the Legislature will attend. 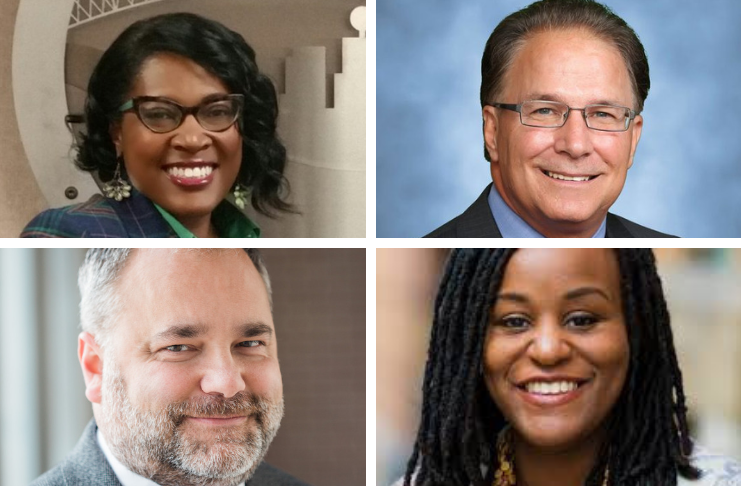 The Advance talked to civic and political leaders in Southeast Michigan about issues they hoped the Democratic governor would address. Some also shared what they think has been missing from speeches over the last eight years under GOP former Gov. Rick Snyder. Sherri Masson of Indivisible Huron Valley, a progressive advocacy organization founded after Donald Trump’s 2016 presidential win, said that she would like Whitmer to address transparency in government, support for legislation to kill Lame Duck sessions, more funding for public schools and how to protect the environment. “We’re hoping that she speaks to the need to pay attention to the water because in our area we have a lot of lakes and recreation area surrounding us in western Oakland County,” Masson said. Jim Murray, executive director of the Arab American and Chaldean Council, describes himself as a “Never Trumper.” He has watched many State of the State messages over the years as the former AT&T Michigan president and a GOP legislative staffer, including to former state House Speaker Rick Johnson. Danielle Atkinson, founder director of Mothering Justice, a Ferndale-based group advocating for family-friendly policies, argues that the address has never been focused on the needs of Michigan families. “Instead of talking about how policies are affecting individuals we have heard a lot about the business community and anecdotal stories of individuals,” she said. “During [his] first State of the State, Gov. Snyder said he would be judged on how infant mortality was doing, and he never mentioned anything about it in subsequent speeches. “Although we know that people of color in the state are disproportionately suffering, there was never a mention of how we could directly impact mothers of color is lives,” Atkinson added. Tom Watkins, who has served as deputy chief of staff during the former Gov. James Blanchard administration and as state superintendent of public instruction during former Gov. Jennifer Granholm’s tenure, had advice to Whitmer in terms of style and substance. “[She should offer] a vision and plan that addresses not only the obvious problems of the day that are the checklists of trade associations and lobbyists, but spell out problems and opportunities around the corner and what will be done to better prepare our state and people to survive and thrive in a changing world,” he said. “I want to hear compassion and aspiration mixed with clarion call and concrete action steps to fix what is broken in our state and nation,” Watkins added. Pamela Pugh wears several hats as Flint’s chief health officer, second vice president of the National Federation of Democratic Women and vice president of the State Board of Education. She believes that gender parity in pay, increased public school funding and infrastructure needs are issues that Whitmer should advance. Keith Williams, chair of the Michigan Democratic Party Black Caucus, said that his members want to see Whitmer address job creation, education and health care.